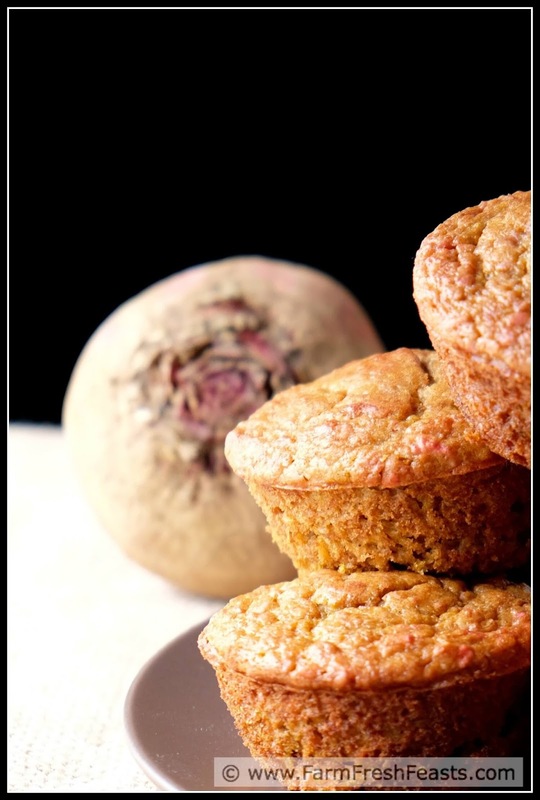 These perky morning muffins have roasted beets from the Community Supported Agriculture (CSA) farm share, oatmeal, and orange juice. 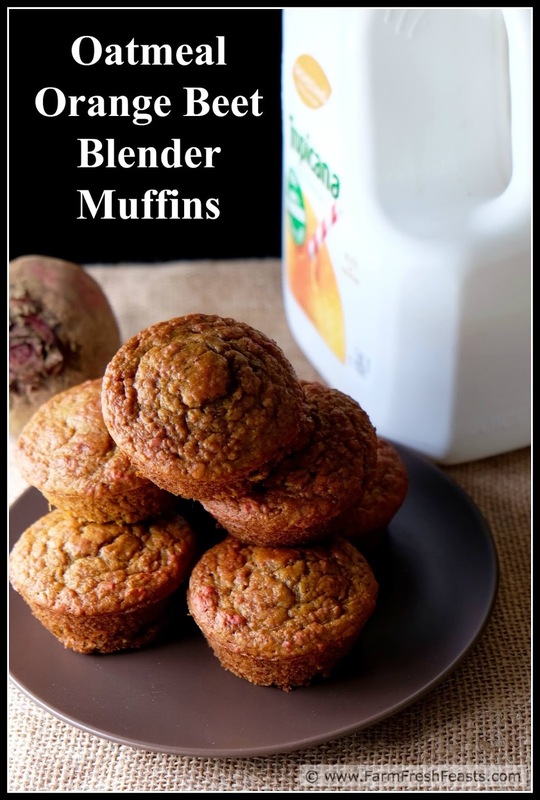 They are easily made in the blender for a smooth batter, bright flavor, and golden hue. We were only engaged for a week, so we didn't undertake any type of pre-marital counseling. Instead we drove from Michigan to New Mexico, seeing the sights en route but probably not avoiding chain restaurants--see this post if you want tips on Local Eating on the Road--since we'd just been living in Germany and were craving all things American. We got hitched once we arrived in Alamogordo. Why the rush? Well, if you're someone in the military who loves someone else in the military there's this thing called a Join Spouse assignment preference. There's no Join Boyfriend or Join Fiancee or Join Significant Other assignment category. You need the paper to make it officially easier to be with the one you love. It made more sense to my spouse and I to get the paper rather than have a big To Do. So we did. Had we undergone pre-marital counseling, however, I would hope that it included the orange juice pulp issue. There are too many choices in the grocery store and the amount of pulp and/or calcium in your OJ is just one example. My spouse likes Lots of Pulp. I'd rather have pulp than not have pulp, so I'll easily go along with his desire. For other recipes using beets, please see my Beet Recipes Collection, part of the Visual Recipe Index by Ingredient. I've been working behind the scenes adding links to recipes from a host of creative and generous bloggers to make this index a resource for folks like me eating from the farm share. 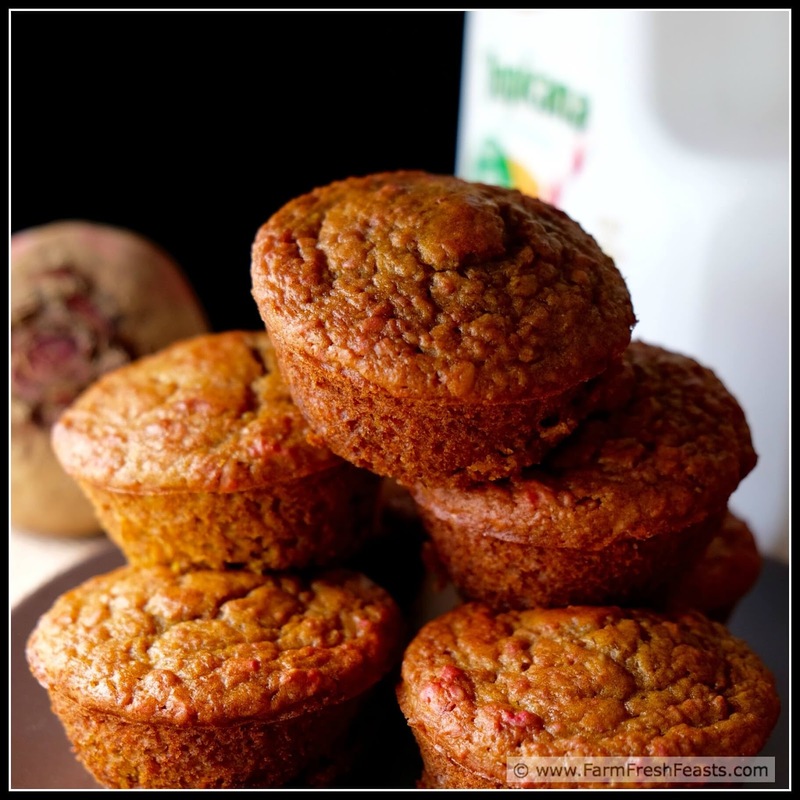 For another muffin recipe using beets, how about a sweet Cherry Beet Yogurt muffin or a savory Beet Horseradish muffin? You can see the brand of OJ I used in these muffins. I am not implying sponsorship and have no relationship with the company. I just bake a lot of muffins, take pictures of most every batch, and merely sticking a beet and a jug of OJ in the photo helps me remember when I come back to edit the photos 51 weeks later. I won't try and pass off these pictures as banana chocolate chip muffins, you know? Note: I roast my beets by cutting off the greens (and using them! ), rubbing the beets with vegetable oil, and wrapping them in foil. I put them on a baking sheet and stick it in the oven, set the temperature to 375 degrees Fahrenheit, and check them after about an hour. If the foil package gives when I squeeze it, they are done. If not, I set the timer for 15 minute increments to check for doneness. Depending on the size of beet it takes anywhere from 45 to 90 minutes, so I usually start in a cold oven and set the timer for an hour. After the beets have cooled it's a simple matter to rub off the skin and roots and enjoy. Preheat oven to 400 degrees Fahrenheit. Spray a 12 well muffin pan, or line with paper liners. In a blender (I use my trusty Vitamix) combine the beets, oats, and orange juice and whirl it around briefly until it is a uniform consistency. Add the oil, sugar, vanilla and eggs to the blender and whirl briefly until everything is combined into a smooth vibrantly fuchsia mixture. Pour/scrape into a bowl. Top with the remaining ingredients, and stir just to combine. Scoop** into prepared pan. Bake for 15-18 minutes until golden. Cool on a rack for 5 minutes in the pan and then remove from pan and cool completely. The pulp/no pulp was not a part of our Pre Cana counseling. Although we did have some crazy questions....like "I'm afraid of my partner," with a yes or no box. Clearly I went with the latter. 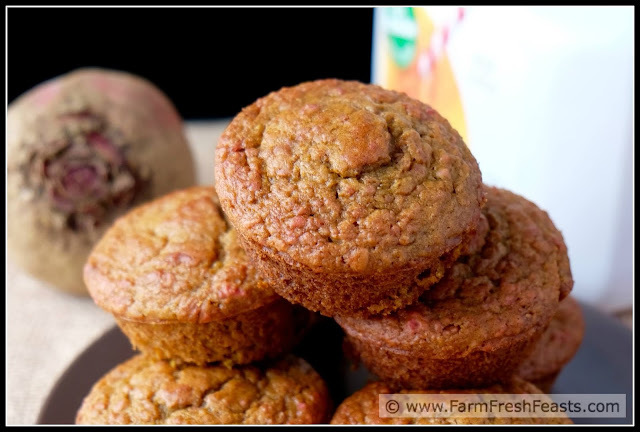 I'm still drinking my beets, although these muffins do sound fantastic. 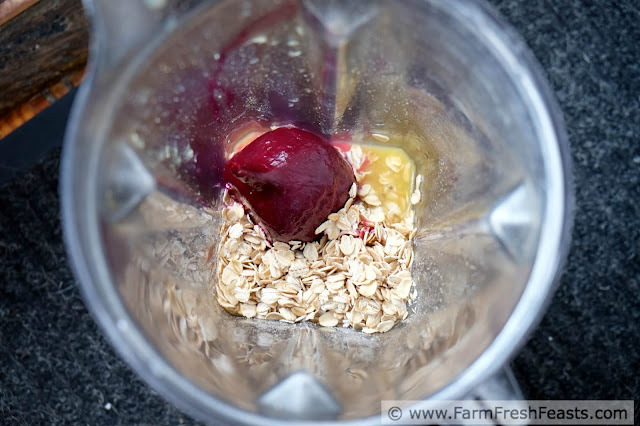 I have resolved to drink beets over the winter, so I've been roasting and vacuum sealing a smoothie's worth at a time.